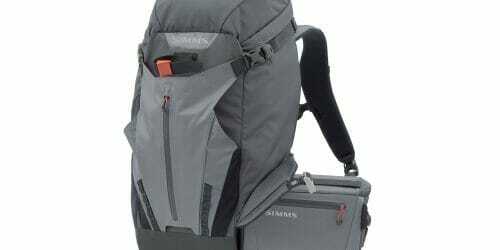 You are about to take a saltwater fly fishing trip and need lines to suit. You’ve searched the net, quizzed forums and read countless reviews. Confusion reigns supreme. Not surprising given there are 100+ saltwater fly lines on the market. Even experienced fly fishers baulk at the dizzying range on offer; trying to piece together clues from (mostly) American scenarios to fit local conditions. This article reduces some of the ‘analysis paralysis’ and proposes a system of FACTS to assist in line selection. Manufacturers categorise lines differently. They use descriptors that observe industry standards (grain weighting) or norms such as water type and ambient temperature, density and sink rate. Some describe proposed application such as target species or environment; others reflect proprietary technology. Brands drive sales with technological advances, backed by clever marketing hyperbole. Lines have a number of component sections. First, a level ‘tip’, usually one foot. Then follows the ‘head’ (made up of a ‘front taper’, ‘body’ aka ‘belly’, and ‘rear taper’) and then a ‘running line’. Modern head lengths vary between 20 and 60 feet. The profile of the head and its component tapers is where the magic happens. Each section’s taper causes the line to act in a particular way. How the diameter of the line changes throughout the profile is key. Diameter is also important to sink rate and how a line is affected by wind. For example ‘intermediate’ lines are generally easier to cast into wind because of lower diameter-to-mass ratio. Density is poorly understood. There are five different densities (aka buoyancy): (1) floating, (2) sink-tip, (3) intermediate, (4) sinking and (5) fast-sinking. A floater and full sinking line could have the same head weight (350 grains) but the density determines if it sinks or floats. Coatings are one area where manufacturers seek to set themselves apart. Some use polyurethane (PU), others polyvinyl chloride (PVC). Tropical lines have a stiffer outer coat so they remain castable in tropical heat. Coating texture ranges from smooth to cross-hatching, bumps and ridges. 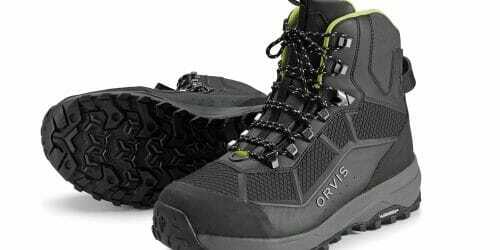 Whether texture makes a difference to flotation and shootability is endlessly debated. Core construction is usually adapted to temperature range. Braided multifilament is suppler than braided monofilament. Saltwater lines usually have a monofilament core with tropical lines using the stiffest core. Some manufacturers use gel-spun polyethylene. Core strength runs from 25 to 100 lb with a number of whistle-stops between. The amount of core stretch is a delicate balance between avoiding excessive ‘memory’ and improving contact with the fly through the line. The American Fishing Tackle Manufacturers Association (AFTMA) published the above table in 1961 as an industry standard for rating lines. They suggest a weighting range measured over the first 30’ – the Head. Their relevance today is hotly debated. Most modern lines do not have 30-foot heads. Only 29 of the 122 considered for this article had a head length of 30’ or shorter. And most tended to be heavily weighted shooting tapers far and above the AFTMA range. Modern head lengths vary between 20 feet and 60 feet. Using a #9 Line as an example, AFTMA prescribes 240 grains (230-250) for the first 30’. Looking at twenty-five #9 lines, the 30’ head weight runs from 240 to 375 grains – the AFTMA rating for a 9 to 12 line. * Not all manufacturers publish first 30’ weights. Head length should interest beginners and journeymen alike. It cannot be seen in isolation from taper and weight, and the range of head lengths across types of lines provides insight into what manufacturers make lines to do. Taking general-purpose lines first, 12 of 35 were shorter than 35 feet. These lines are made for all round conditions and have that “just right” taper to suit myriad scenarios. They have to throw small and large flies across a range of distances and conditions. Tarpon lines are a good example of a relatively consistent cohort – 7 of 12 fall in the 35 to 40 feet range. The ones outside this range are at the extremes (<30 feet or >55 feet) are designated as essentially specific short or long lines. Based on head length, the sweet spot for tarpon fishing is between 35 and 40 feet. More on species lines later. Herein lies an easy choice if you are looking for a floater. Look at price point, taper profile and anything else that takes your fancy. Most general-purpose head lengths fall between 35 and 45 feet. The short-headed lines tend to be punchier, long-headed lines less so, but there are plenty of happy mediums in this group. The range is generous at 30-plus choices. Temperature suitability tends towards temperate environments. They won’t act like a noodle in the sun, nor will they resemble fencing wire. Some are tropical rated. Remember that the floating lines’ principal applications are shallow water and top water. They may not actually represent ‘general-purpose’ in many cases. The best choice may be an intermediate line if you need to get deeper. Many intermediate lines are essentially general-purpose lines. They sink at a rate of between 1 (Hover lines) and 2 inches per second (IPS). Depending on current and weight of fly, the line will sink about a foot every 6–12 seconds. These are very effective because the line draws the fly through the water column at a rate that still gets bites on the drop. You can count-down these lines so you know when you’re roughly at a desired depth. They cast very well, especially into wind. Their clear or opaque coatings also make them rather stealthy. For many heading north, say Weipa or Hinchinbrook, an intermediate line will meet most of their flats and pelagic fishing needs. Heavy headed versions (e.g. Titan and Outbound) are also made to throw heavy flies in bigger rod weights. The primary downside of intermediate lines is that, compared to floaters, they are harder to pick up and recast quickly without stripping line in. Here we find some confusion creeping in. Sink tips aren’t all clear and clear tips don’t all sink. Full clear floating lines are made by Airflo, Monic and Cortland. They come in a range of weights from WF6 to 12, covering all bases from bream to giant trevally. They suffered from excessive memory in the past but each generation seems better. The stealth benefits of these lines cannot be understated. Many serious flats anglers in the States use them. Your leader effectively becomes a whole lot longer and stealthier. However, tracking the line in the air can prove difficult. On landing, the angler can easily lose sight of the front taper against the surface of the water, thereby losing track of where the fly is in relation to the fish. These lines can also be very slick, causing the haul to slip in the fingers at times. Clear tip floaters are least common and are made to provide improved stealth over a coloured floater. Like full clear lines they allow shorter leaders. 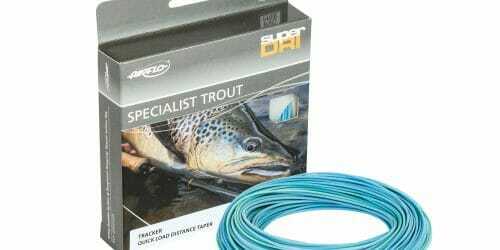 They provide better tracking than full clear lines and are very versatile when fishing for shallow-water fish such as barramundi on banks and drains. You can overshoot but not spook. Sinking tip lines (often called wet tip or intermediate tip lines) have a floating running line with a head that is part floater, part sinking tip. These lines typically have a clear or opaque front taper or tip that sinks at the rate of an intermediate line. Depending on manufacturer, sink rate can vary from 1 to 2 IPS. The length of the sinking part of the head also varies from 10 to 15 feet. These lines have a far bigger following in Australia than in the US. They represent the best of both worlds in many ways. They are easier to pick up and recast than a full intermediate, but the sinking tip allows the fly to get below chop and wave action and get down deeper more effectively and quickly than a floating line. The tip provides stealth and also helps anchor a fly in current. 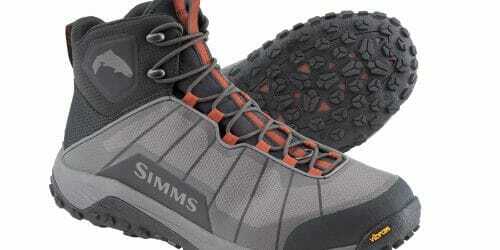 Their downside is they can be trickier to use when wading very shallow waters, where the sinking tip is a hindrance. Called everything from Outbound (RIO), Sniper (Airflo), Ambush (Royal Wulff), Titan (SA) and so on, these lines feature a short (25–30′) aggressively tapered, heavy head. The head is often weighted two or more times higher than its labeled size. A WF9 could be as heavy as a WF11 if using the AFTMA tables. Shooting tapers are used to cast big flies quickly with minimal false casting. The compromise is that their heavy, splashy heads affect ‘presentation’ style casts. They work well casting big flies especially over extended distances. Sinking lines come in a vast array of styles. A whole piece could be dedicated to them. Many run to saltwater sizes and grain weights but are not designated saltwater lines. There are some common misconceptions about them, for example, that a high grain count equals a faster sink rate — again, the density issue. They come in a range of sink rates, anywhere up to 10 IPS. They sink to a specific depth more quickly than an intermediate. They are often called ‘fast sinkers’ for this reason. Sinking lines are for fishing deep edges, plumbing deep snags, rock bars and reefy areas. They also get your fly underneath schooling fish quickly if larger fish wait below. Most manufacturers have a Bonefish line but the label and the picture on the box is where similarities end. 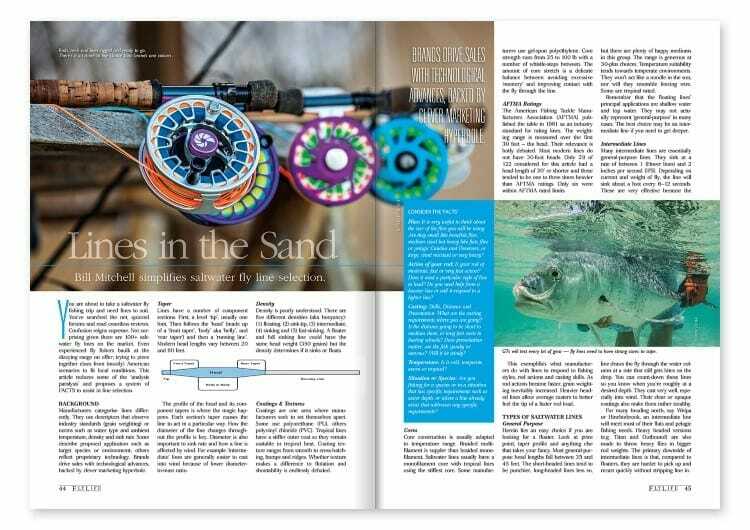 Kaufmann and Fernandez agree that the 8-weight is the ideal rod for bonefish. Indeed a WF8 bonefish line suits many applications in Australia and is a good general-purpose line for southern species. Bonefish lines come in floating and intermediate versions, making them a versatile choice for light saltwater. Head lengths vary from short (35’6″) through to long (54′) but all but one are 38′ or longer. Most bonefish flies are relatively small by saltwater standards (#10 to #2). Our own application for these lines follows suit: small flies, long casts, stealthy presentations, wind and predominantly skinny water. Think whiting and bream in lower weights; salmon, flathead, trevally in higher weights, and a range of flats opportunities with smaller flies. Remember, they are tropical rated and this may affect application. All manufacturers have a Redfish line. While we don’t have redfish, we have plenty of use for their lines. Redfish tapers are chunky (27′ to 37′) compared to the longer heads of bonefish lines. They are made to throw heavy or bulky flies at short to medium range and to load fast-action rods well in-close. They are also made to handle topwater flies such as poppers and gurglers. Redfish lines match well to our fisheries where we are fighting wind with WF8–10 outfits. These lines are all full floating lines made for shallow water fishing. They work superbly well for tropical species that eat big flies, such as trevally and queenfish. Some are cold water rated also. Some have used dual designation over time like Airflo’s Bonefish/Redfish. Surprisingly, only RIO has a Permit line though others like Airflo include them in dual species designations. In many ways, these lines typify what Australian flats fishers need. Not only for permit but for other potentially spooky species like golden trevally, tuskies, bastards, etc. Head lengths are long (almost 50 feet) and in many ways Permit lines resemble supercharged Bonefish lines. Tarpon lines account for a huge portion of the saltwater market in the US. Accordingly, there are many choices. These lines are made to do it all – throw long, throw accurate and carry flies on long leaders. Head length is mostly between 35′ and 40′ with a few very short (30′) and very long (60′) exceptions. Tarpon flies are not huge but wind can be tough on ocean fisheries. Obviously these lines lend themselves to fishing pelagic and larger saltwater fish like queenfish, trevally and tuna. These lines can be found from WF10–13 size, making them a great choice for big fish. They are also found in floating and intermediate versions. Striped Bass lines are invariably cool or cold water lines. They have typically short, punchy heads that are made to throw large baitfish, topwater and weighted patterns. Striper flies can be huge and heavy. They also form the predominant cold-water species specific lines for salt water. Think colder water brutes like kingfish, mega salmon and southern tuna. Bass and warmwater lines warrant some attention here. They include freshwater lines for big trout and bass (US) and those for the apex predators pike and muskellunge. Of all species-specific lines, Bass lines directly transpose to our bass fishery. Musky lines are more what we would use for Murray cod. These lines can work very well in temperate and colder environments and are made to throw big flies. 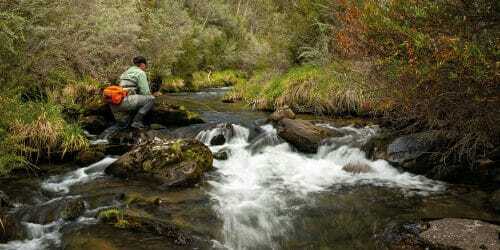 Any fishing done in rivers, against banks or amongst structure may suit these lines. As they are also found in lower weights WF5–6 they present an option for throwing bigger flies to species like estuary perch, bream and mangrove jack. The range of lines is broad and there are many areas of crossover and duplication. Lines WF8–10 attract the most attention from manufacturers and are represented in almost all general and species-specific lines. Lines in WF9 are found in all styles of line. So what methods do we apply to sift through all these choices? For some, brand will drive choice. And hey, there is nothing wrong with that. However, there is no reason why one wouldn’t still use some rigour to cross check choices within chosen brand offerings. So, once you have chosen a brand, use the other methods to narrow the field. Using the Line Coverage Table (Table 1), some choices will be quite narrow (typically at the ends of the spectrum – super light and super heavy). Obviously if you are tackling marlin on 13/15-weight rods, then the size of the outfit will almost certainly narrow the field. But, if you were looking for a WF12 then General and Tarpon tapers would come into play. Obviously thought needs to go into density as well. There are cases where species-specific lines fit our needs and conditions, but we must be careful about assumptions. For example, Bonefish and Permit lines are not ideal for our local fisheries. 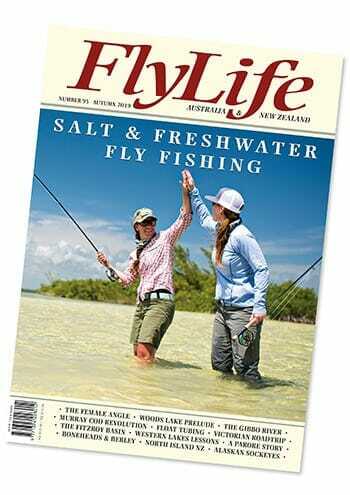 In Australia, bonefish and permit are targeted with wet tip or intermediate lines and rarely with floaters. The species-specific line that best suits our bonefish and permit fisheries are probably the Tarpon lines, with most preferring tropical wet tip and intermediate lines. Applying species-specific lines to our fisheries can be done, and the table below provides a ready reckoner for line selection if you prefer a quick method. It should be noted that some species-specific lines (Bonefish, Tarpon, Striper) come in floating and intermediate iterations. Choosing lines based on temperature is most effective where choices are limited. Coldwater lines are the most stark example of this because of the limited range. However, many temperate, even tropical rated lines will still work in cold conditions. Tropical lines will not be optimal in cold though. Rarely will it work the other way at the extremes: coldwater lines will likely be a disaster in tropical heat. Flies: It is very useful to think about the size of the flies you will be using. Are they small like bonefish flies, medium sized but heavy like flats flies or pelagic Candies and Deceivers, or large, wind resistant or very heavy? Action of your rod: Is your rod of moderate, fast or very fast action? Does it need a particular style of line to load? Do you need help from a heavier line or will it respond to a lighter line? Casting: Skills, Distance and Presentation. What are the casting requirements where you are going? Is the distance going to be short to medium shots, or long fast casts to busting schools? Does presentation matter: are the fish spooky or nervous? Will it be windy? Temperature: Is it cold, temperate, warm or tropical? Situation or Species: Are you fishing for a species or in a situation that has specific requirements such as water depth, or where a line already exists that addresses any specific requirements? Flies will be Candy style flies. Action: rod will be a stiff #10 or #11. Casting will be long casts at fast-moving fish. Tuna require a fast delivery intermediate line or intermediate head. Lines that can be cast quickly at distance include Tarpon, Striper, and shooting taper style wet tips and intermediates. Flies will include heavy 2/0 to 4/0 Pink Things and Barra Bombs. Action: moderate to fast #8–9 rod. Casting will be short to mid range. Situation involves ambush predators lying deeper in snags or rock bars. Depth and current may warrant a sink tip or intermediate line to get the fly down. Lines with chunky front tapers like Redfish and Tarpon lines or Shooting tapers will assist with casting heavy flies, especially in the 4/0 range with large dumbbell eyes. Flies will be relatively small but may include some bulkier surface flies. Action: medium-fast #5 or #6 rod. Casting will be short/medium accurate shots in tight to structure. Situation/Species: spooky and fussy fish requiring good presentation. Suitable floating lines will include Bonefish (5–6), Redfish (6) and Bass (6) tapers. Redfish and Bass lines will better suit larger surface flies. Flies will be Surf Candies, flats flies and barramundi flies. Casting will be at all ranges. Presentations may need to be mid to long and stealthy at times on the flats. Situations and species favour a full intermediate line. Best options will be tropical saltwater intermediates and intermediate Bonefish lines.